Ribbon cutting scissors are the star of the show at any grand opening or inaugural event. Given the name you would think the ribbon takes precedence, but aside from visual appeal, giant ribbon cutting scissors are the tool that makes a grand opening complete. The person performing the ceremony is likely a very important part of the organization; it could be a business owner, executive, influencer or person being honored. In any case, a pair of oversized grand opening scissors symbolically confirms that importance. Not to mention, holding such a sturdy pair of scissors as they smoothly clip through the ceremonial ribbon makes the person feel important as well. It is an honor likened to the lighting of the Olympic flame with the historic torch. That is why it is so important to choose a pair of scissors that reflects just how special your ribbon cutting participants are. 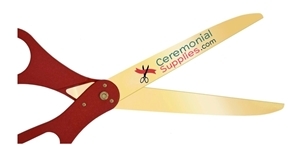 CeremonialSupplies.com will help you find the most adequate ribbon cutting scissors for your ceremony. We help the smallest of businesses to the largest corporations find scissors that fit their exact needs at a price that is friendly to all. Choosing the right ceremonial scissors may not seem like a big task; the truth is, some people even use standard household scissors and they still get the job done. Not a pretty sight. The intention of a ceremonial grand opening is not to merely cut a ribbon for the sake of cutting it; the real reason is to present your new organization or cause in an elegant way. It is a way to show people that this occurrence is special and worthy of a graceful celebration, so choosing your scissors should matter. You want memories of the event to stand the test of time—with the aid of photographs, video and press coverage—or your grand opening was done in vain. Truly memorable ribbon cuttings are performed with the use of oversized scissors with colorful handles that represent your brand or cause. 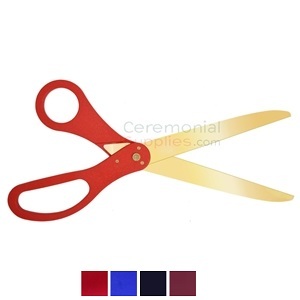 Ideally, the color of the scissors works in concert with the ribbon and the rest of the event décor for better representation. What Colors and Sizes Are Best? The size of your ribbon cutting scissors is totally up to you, it all depends on the type of grand opening you are planning. While every ceremony is special, you may be aiming for a different style depending on the audience you want to target. It is different if you are video game company targeting young adults than if you are a real estate developer with an elite audience. 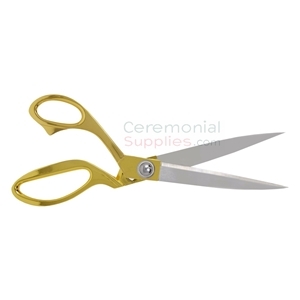 In either case, both audiences will take you seriously, but you may find that the ceremonial scissors with golden color blades are better suited for the latter as they portray luxury and elegance. Meanwhile the metallic finish is more casual and better suited for ceremonies where you don’t have to try so hard to impress your audience with décor. That is not to say that the colors cannot be used interchangeably between events, but you should consider these factors before making your selection. As reiterated in the past, the color of the scissor handles should be dependent on the colors that represent your organization/brand. You have various possibilities based on your color selection of ribbon, font and additional décor. 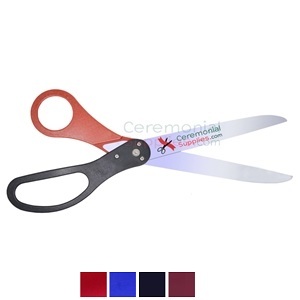 Matching color handles is a possibility if you have a multi-colored scheme and the other accessories are complementing the color of the scissors. But you also have the option of combining two colors in the handles in one pair of scissors. If your brand or cause is not represented by any particular color, traditional red or royal blue are pretty safe options that will look great in images. Lastly, the size of your grand opening scissors matters. 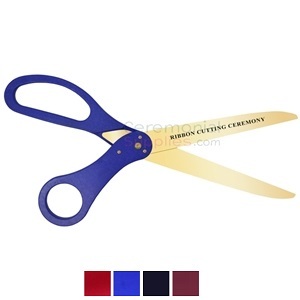 You want scissors that stand out and show that they are being held by the MVPs of the ceremony. Depending on the size of your gathering, you may find certain lengths are more suitable than others. 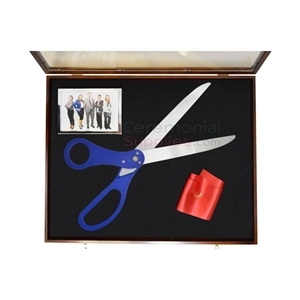 A pair of 30” scissors may be more suitable in a bigger room because they will be more easily visible from far. If the room is smaller, a pair of 25” or smaller scissors may be just fine. 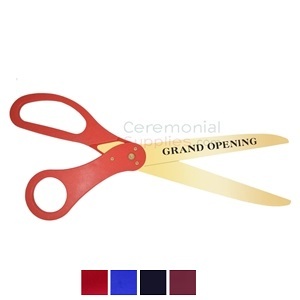 Regardless of what type of scissors you need, CeremonialSupplies.com is your best source for elegant ceremonial ribbon cutting scissors for your grand opening. Contact us and we will help you make it a success!